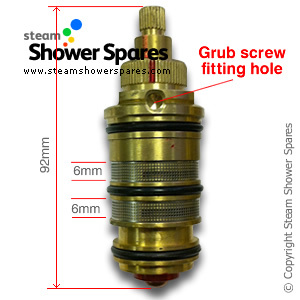 Thermostatic shower valve replacement cartridge. 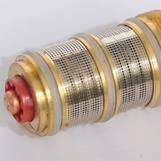 This is a push fit type that is held into the valve housing with a grub screw (Type 6 / SP151). The overall length is 92mm. We only recommend like for like replacement of this part. There are many different shower valves available, some look similar, but may not fit. It is important you choose the exact correct type to avoid leaks. 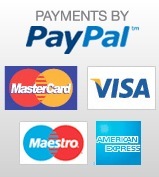 Please check our page on compatibility for information of this item will suit your shower model and make. 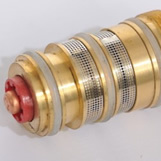 This thermostatic cartridge is also referred to as TYPE 1 for Insignia showers and is identical. GENUINE AQUALUSSO REPLACEMENT CARTRIDGE AND 100% COMPATIBLE WITH INSIGNIA AND OTHER MAKES. Click the following link to download our helpful guide to the removal and identification of our Thermostatic Cartridges. Please note our cartridges can arrive 'wet', this is not because they have been used, but simply that they are tested after production and occasionally water remains inside the item, with can find it way out whilst passing through the postal system on its way to you.